The Pro Breeze PB-02 uses peltier technology. This means it's quiet and cheap, but much less effective at removing moisture. If you're happy for a dehumidifier to remove small amounts of moisture over long periods, it's a reliable option that provides great value. For removing moisture quickly or handling high levels of humidity, go for a refrigerant or desiccant model. 1.1 What is Peltier Technology? If you’re looking for a compact and cheap dehumidifier, the Pro Breeze PB-02 500ml dehumidifier is one of the most popular options. It’s less than half the price of even the cheapest compressor models, has a highly portable design and is built with energy-efficient peltier technology. How does the Pro Breeze dehumidifier compare to more expensive options though? And who should consider buying it? Keep reading our review to find out. Before we get into the review, it’s important to set realistic expectations of a peltier dehumidifier. These models certainly have their uses, as they are generally reliable and easy to use. They are also lightweight and use minimal energy. Peltier dehumidifiers are not designed to replace highly efficient compressor or desiccant dehumidifiers though. If you expect this level of performance, you are going to be disappointed. Instead, peltier dehumidifiers are designed to slowly remove small amounts of moisture over time, rather than quickly reduce humidity to a safer level. With that out of the way, let’s continue with the review. The first thing you notice about the Pro Breeze is the simple and mini design. The control panel has a simple On/Off switch and two indicator lights – there’s no built-in humidistat, laundry mode or other features found on full-size dehumidifiers. There’s also no digital display. As the Pro Breeze doesn’t have a built-in humidistat, you can’t set a target humidity like on more expensive models. While a humidistat is a useful feature, the slow extraction rate and low energy consumption makes it less of an issue on peltier models. On the plus side, the simplicity makes it easy to use. There’s no need to mess with settings or modes – just switch it on and leave it. Pro Breeze has also designed the water tank to be straightforward to remove, with a plug to prevent spillages. Another advantage of this dehumidifier is its compact size. With dimensions of 18cm (w) x 28cm (h) x 16cm (d), it’s one of the smallest dehumidifiers on the market. It’s a mains-powered model though, so it doesn’t have cordless or rechargeable technology. Peltier dehumidifiers – sometimes called thermo-electric – remove moisture differently to compressor or desiccant models. Electricity is used to create a temperature difference, causing one side of an internal element to heat up and the other to cool. As warm and humid air enters the machine, it first reaches the cooler side, causing moisture to condense and drip into the tank below. While peltier dehumidifiers are energy efficient, quiet and reliable, these models remove much less moisture than other types. You’ll need to leave them running for long periods to gradually reduce humidity and they are not suitable for whole homes. The Pro Breeze has a 0.5 litre water tank. 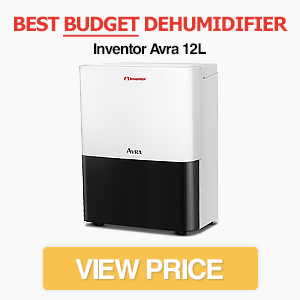 This is generous considering the compact size and low extraction rate – most dehumidifiers have a tank that’s smaller than the maximum extraction rate. The result is that you won’t need to empty it every day. It also has an automatic shut-off function when the tank is full. This is a standard feature on modern dehumidifiers, but we were pleased to see it included in this low budget model. A downside is that there’s no option for continuous drainage. If you want a dehumidifier that can run for extended periods without human intervention, the Pro Breeze isn’t the right option. 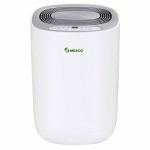 With its slimline and lightweight design, the Pro Breeze is a portable dehumidifier that’s easy to move around the home. There’s no wheels, but these are unlikely to be necessary as it only weighs around 1kg. For comparison, even the lightest “full” models weigh more than 5kg. The compact size also means that it won’t take up much space in a room. It can even sit on larger window sills, which can be useful for keeping a room clear. It’s worth pointing out that the “500ml” in the PB-02’s name refers to the size of its water tank, not the daily maximum extraction rate. The actual extraction rate is 250ml per day. As you might expect, this is considerably lower than refrigerant or desiccant dehumidifiers. Even the cheapest desiccant models can extract up to 6 litres/per day in the right conditions, so the Pro Breeze dehumidifier is only suitable for small rooms and mild humidity. In other words, don’t expect the Pro Breeze to quickly bring the humidity in a room down – especially if there is a significant moisture source. You’ll need to leave it running for long periods to have a noticeable effect. It still removes a surprising amount of water from the air though. If you have a small space that’s suffering from mould, condensation or just uncomfortably high humidity, the PB-02 can certainly help. The lightweight design also makes it easy to move around the house to where it’s needed most. Note: If you need a higher extraction rate, Pro Breeze also manufactures a 1500ml model. This has a higher 500ml/day extraction rate – although it’s still nowhere near as effective as a desiccant or refrigerant model. 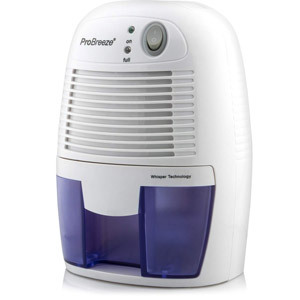 The Pro Breeze PB-02 is not suitable for use as a whole home dehumidifier. It’s great for removing moisture in small areas, such as in boats, caravans, university accommodation, wardrobes or single rooms, but it doesn’t have the extraction capacity for dehumidifying larger volumes of air. If you need a whole house dehumidifier, check out our list of the best models on this page. Peltier technology might not be as effective as a compressor, but it’s certainly quieter (although not silent). If you need a dehumidifier that’s suitable for working environments, or that won’t interrupt the TV, the Pro Breeze is an option to consider. Its quiet operation also makes it a great choice for university accommodation. side from being cheap and quiet, peltier technology uses much less energy than a compressor or desiccant alternative. This means the Pro Breeze 500ml functions with a maximum of just 23W of power. 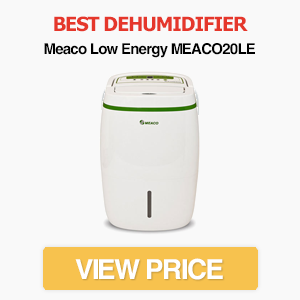 In comparison, the Meaco Low Energy 12L uses an average of 165W. Of course, the Meaco removes a lot more moisture than the Pro Breeze. There is also no option to automatically switch off when humidity reaches a certain level, so you’ll need to control it manually. But if you need an energy efficient dehumidifier, the Pro Breeze uses minimal power. Despite what some people might advise, the Pro Breeze is not suitable for use in a bathroom or near water. If you need to dehumidify a bathroom after a hot shower, open the door and put the dehumidifier just outside (but far away from any water sources). As we mentioned earlier, the Pro Breeze has the simplest control panel of any dehumidifier we’ve reviewed. There are no settings or modes, so the only button switches is to turn it on. Pro Breeze has also included indicator lights for when the machine is running or has a full tank. Other than that, you have no control over the dehumidifier’s mode or target humidity. Despite the low extraction rate, small size and lack of features, it’s hard to argue that the Pro Breeze doesn’t provide value for money. It’s much cheaper than more advanced dehumidifiers and still removes a noticeable amount of moisture from the air. It’s important to understand its limitations though. Don’t expect the performance or features of a full-size dehumidifier. The Pro Breeze PB-02 is a basic dehumidifier with a low extraction rate and small water tank. It’s not designed for removing moisture from large areas and is nowhere near as effective as a compressor or desiccant model. With that said, the low price means you wouldn’t expect it to match full-size dehumidifiers. It’s a lot cheaper and smaller, so it’s unfair to compare it with models costing five times more. This makes it difficult model to score. If you need a simple dehumidifier for a small room, the Pro Breeze is a great choice – as long as you have realistic expectations and don’t mind running it for long periods. If you want to reduce humidity quickly, remove moisture from a large space, or need features such as continuous drainage or target humidity, the Pro Breeze dehumidifier is likely to be a disappointment.